Royale Chulan Seremban (formerly known as The Royale Bintang Resort and Spa Seremban) is situated at the Lake Garden district of the state capital of Negeri Sembilan Darul Khasus. This 4-star suburban property offers guests a place where their utmost comfort is provided through excellent amenities and accommodations. Both business and leisure travellers will get to appreciate the view of the hilly landscapes of Seremban and the culture of hospitality Royale Chulan Seremban is known for. Location and Accessability Royale Chulan 4-star hotel in Seremban is in the city of Negeri Sembilan and has easy access to places like Istana Seri Menanti and Seremban Parade Shopping Mall. It is 30 minutes from the Kuala Lumpur International Airport, 20 minutes from Port Dickson seaside, and 8 minutes from the bus terminal. RelaxationMore than just the perfect destination of leisure and business travelers, our hotel in Seremban provides guests with comprehensively equipped rooms to ensure complete comfort and tranquility. Spoil Your Taste Buds Savour sumptuous dishes and buffet spreads with our various dining options. We offer dishes that satisfy every taste bud and will surely satiate the gourmand in you. Royale Chulan Seremban caters to business and leisure travellers who we welcome with the hospitality embedded in the Negeri Sembilan culture. From the interior and design to the services and accommodations, our hotel in Seremban proudly showcases Malay heritage combined with contemporary luxuries we are known for. Watch our video to learn more about Royale Chulan Seremban. 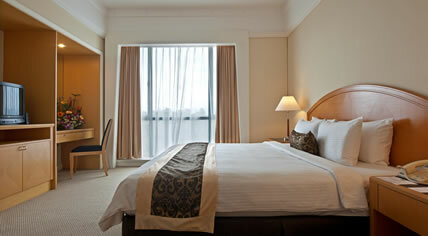 appointed rooms and suites that offer luxurious comfort to guests. All rooms feature Wi-Fi Internet access, telephone with IDD, large writing desk, private toilet and bath, mini bar, and more. Guests will also be treated to a panoramic view of the surroundings of Lake Garden and its natural beauty. We provide an indulgent stay at great value. Check out our room promotions to learn about great discounts on your hotel stay. You will surely have a good time at Royale Chulan Seremban with the sports and recreational facilities we offer. Beat the heat and take a dip in our outdoor swimming pool with waterfalls and slides. Have a unique wellness experience with our fitness and spa centre. Have a unique gourmet experience with us. Check out our F&B promotions and take a culinary journey at Royale Chulan Seremban.